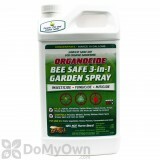 Organocide by Organic Labratories is a 3-in-1 Garden Spray, it works as a Fungicide, Insecticide, and Miticide. Effective for use on all stages of small soft bodied insects including the eggs, larvae, and nymphs as well as listed fungal diseases. Safe to large and beneficial insects such as beetles, bees, butterflies and lady bugs. Formulated from all natural sesame and edible fish oils, for use in organic gardening but also safe to use around your children, pets and home! Due to it's superior suffocating action on small, soft bodied insects, Organocide is heavier and more effective than other petroleum based horticultural oils. Do not apply when temperatures exceed 95 degrees. This product is safe enough to spray up to harvest time and replaces many “hard” synthetic pesticides. For use on fruits, vegetables, nuts, herbs, vine crops, spices, greenhouse crops, ornamentals, turfgrass, bulbs, flowers, landscape plants, and field crops. EPA exempt and OMRI Certified. Dilute 2 oz. 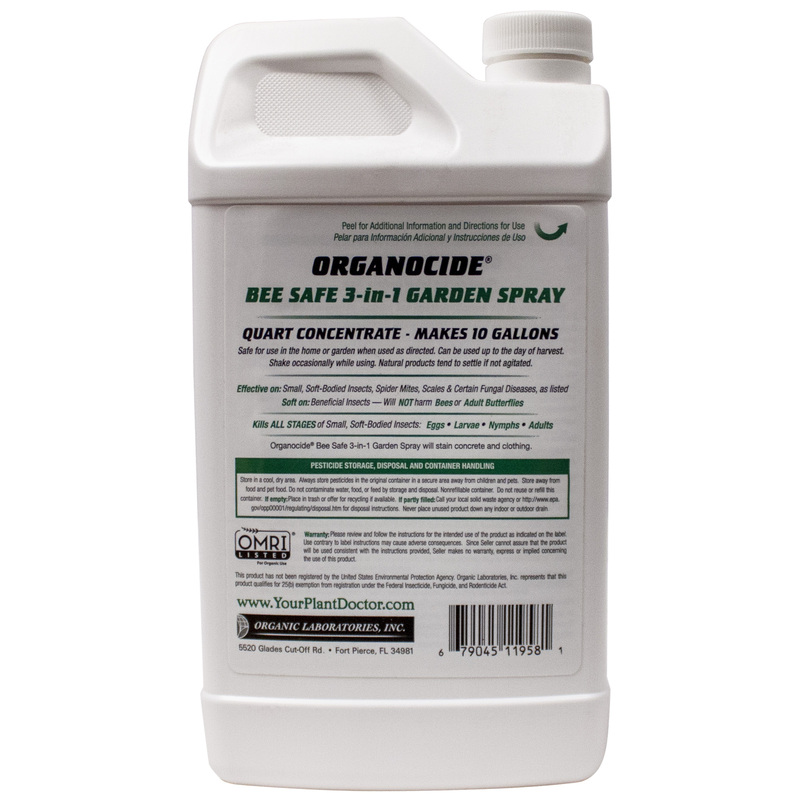 of Organocide 3 in 1 Spray per gallon of water. Once diluted, shake occasionally to prevent separation of Organocide 3 in 1 spray and water. Use a sprayer that will put out a fine spray. If spraying on severly stressed or damaged plants, consider using a lower rate such as 1 oz per gallon to avoid adding additional stress. For best results, spray in the early morning. A single application is normally enough for control. For norma maintenance, spray once per month or as needed to spot treat areas. For severe problems, make two applications 3 days apart. Retreat in 7 days in problem persists. I purchased this on the recommendation of DMOPC to use on a large Cephalanthus occidentalis which was badly infested with aphids and sooty mold. I gave it one treatment per the instructions and 4 weeks later the plant is in excellent shape with no trace of any infestation. Purchased this to help control the garden pests for this years garden. Delivery was outstanding. So far the product is working very well. Is Organocide 3-In-1 ok to use on apple trees? Yes, the Organocide 3 - In - 1 Garden Spray Concentrate is safe to use on apple trees and even allows you to harvest the same day of application. How many times do you use Organocide 3-In-1 Garden Spray Concentrate? Everyday? A single application of Organocide 3-In-1 Garden Spray Concentrate is normally enough for control. For normal maintenance, spray once per month or as needed to spot treat areas. For severe problems, make two applications 3 days apart. Retreat in 7 days in problem persists. How long until the fishy smell goes away using Organocide 3 - In - 1 Garden Spray Concentrate? I sprayed the Organocide about 6 am this morning- when I checked my plants around noon I noticed they were very oily, and some of my herbs didn't smell like they should, they all smelt very fishy. Since Organocide 3 - In - 1 Garden Spray Concentrate uses sesame oil, it will b oily. The smell should disapate with in a day or two. If you have more questions please visit Organic Labs website http://www.organiclabs.com/index.html or call us 866-581-7378. I sprayed my 12 indoor house plants and i have two dogs is this safe? I saw the front of label of the bottle, saying safe for pets and home..that is where I got confused and sprayed all my indoor plants flowers tree ext..because they had tons of bugs. Yes, the Organocide 3 - In - 1 Garden Spray Concentrate is safe for pets. Although, you should be sure to keep pets away from the treated plants until it has dried. 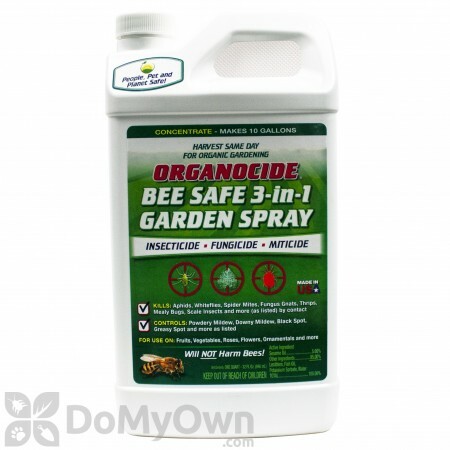 Will Organocide 3 - In - 1 Garden Spray Concentrate kill Argentinian ants? Lots of ants in organic raised vegetable bed on strawberries celery corn ect. No, the Organocide 3 - In - 1 Garden Spray Concentrate is not labeled for ant control. However, we do have an OMRI compliant bait that works very well on Argentine Ants. The Mother Earth Granular Scatter Bait offers long-lasting, broad-spectrum control for preventative and curative treatments. You would simply spread bait with a spreader at a rate of 4 - 6 oz/100 ft. in a band at least 2 ft. wide around your raised vegetable bed, house foundations, patios, driveways, sidewalks, entrances, and other areas where insects are present. Do not apply directly to or inside of the vegetable bed.